Silk Royal's 60th release features a consistent contributor in recent months, Spanish sensation Vitodito. 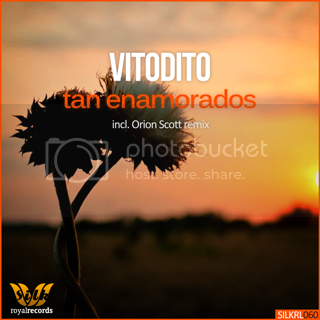 His first solo single on our imprint is romantically entitled "Tan Enamorados" (or "So in Love"). It begins, innocently enough, with a light, minimalist beat; as the song nears the quarter turn, a euphoric, layered lead begins to get filtered into the mix, as well as a flirtatious vocal sample, one of the most distinctive and memorable hooks. In the break, the emergence of additional bass layers, as well as a few more delicate side melodies, give the track some extra low-end and midrange weight. The drop to follow is unexpectedly explosive, which only adds more blissful vibes to the affair. Orion Scott is a brand new alias of Full Tilt, whose memorable "Take Me Away" graced the esteemed Anjunadeep imprint last year. As "Timmy & Tommy", they also host a popular show on Ireland's Highland Radio and run a label of their own, Full Tilt Recordings. We are thrilled to present their work here, the one and only remix in the package. It kicks off with a filtered, 80's-influenced bassline, as well as a house-influenced rhythm section, while the hypnotic vocal sample from the original is teased into the mix. In the breakdown, the funky pad layers reach their full crescendo; all of the elements coalesce to "retro" perfection in the jubilant drop.